Avia 14s are now frequent visitors to the West. OK-ICC of Czech Air Lines is one of four working the Prague-London route. YR-ILF of Rumanian Air Transport operates the weekly Budapest-Kastrup service. LIM-2. Exclusive to Air Pictorial, the first original air-to-air view of a MIG-15bis, which is licence-built in Poland and recently redesignated LIM-2. The MIG-15bis (NATO: "Fagot B") has aerodynamic refinements and a 5,950-lb. s.t. Klimov VK-1 (Nene development) turbojet, whereas the older LIM-1 has the earlier Nene development, the 5,450-lb, s.t. Klimov RD-45F turbojet. This view shows clearly the wing slipper tanks, rear air brakes and nose armament (two 23-mm. Nudelmann-Suranov NS cannon and one 37-mm. N cannon on the starboard side). The fuselage of the fourth production Comet 4 G-APDC was moved from the Hatfield assembly line on 7th November to join 'DA and 'DB in the equipment bay. The c/n. 6404 appears on the small dark strip aft of the cockpit. GERMAN GANNET. Fairey Gannet T.Mk.5 trainer, serialled UA99, is the first of the batch on order for the German Navy; the rest will be delivered during next year. 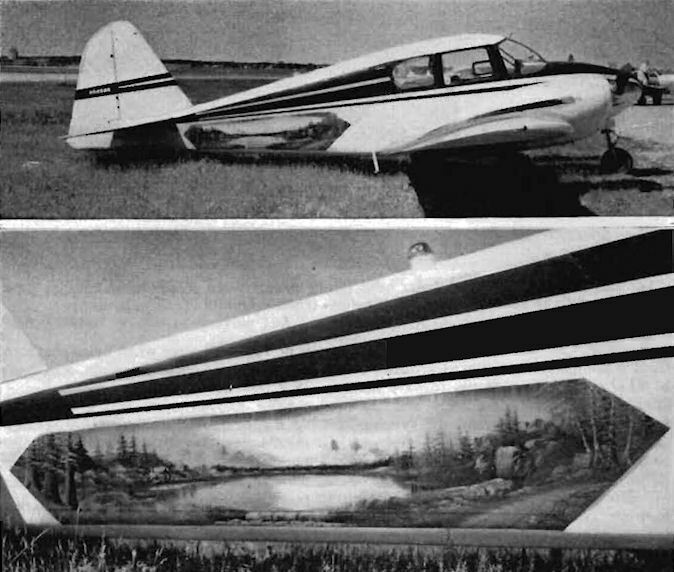 The T.5 is a three-seater powered by an Armstrong Siddeley Double Mamba turboprop engine of 3,600 s.h.p., plus 710-lb. thrust. It is externally similar to the T.Mk.2, and like all training Gannets lacks the "dustbin" radar usually fitted under the fuselage of the anti-submarine marks. Warhawks of the R.N.Z.A.F. were generally camouflaged in light earth and foliage green on upper surfaces with light blue on the undersurfaces, using Australian dopes and paints, writes Bruce Robertson. Others were in the standardised American olive drab and neutral grey. 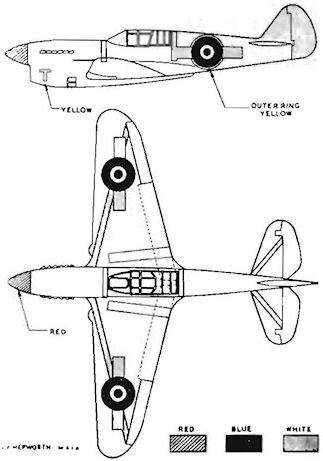 The elaborate striping was to assist recognition; the particular need being the similarity in outline of the Warhawk and the Japanese Tong. Striping was usually in white, but occasionally aluminium paint was used. Regarding squadron letters, these were discontinued in October 1942 as a security measure. There were then too few squadrons to risk a Japanese assessment of strength. Only in late 1944 did they reappear, but within each unit coloured individual letters and spinners were permitted. 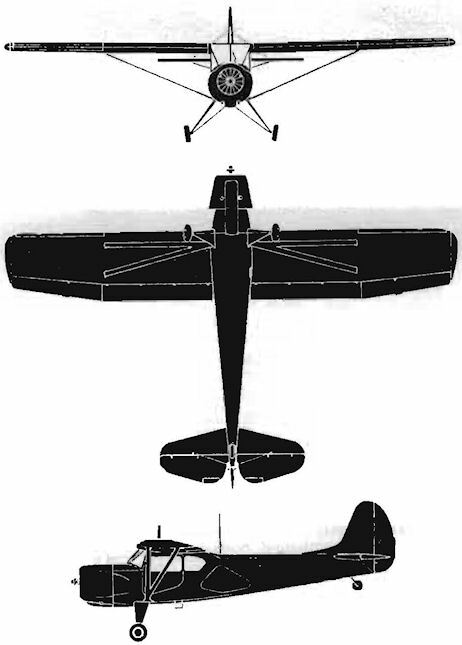 The Kittyhawk "T" illustrated was serialled WZ3253. So true to scale are this mock-up that the casual observer might be forgiven in mistaking it for the real thing, but in fact this is only model. Winner of a United States Navy Bureau of Aeronautics design competition for a utility helicopter is the Kaman HU2K-1. Prototype and production models will be powered by a General Electric T-58 gas turbine. "CIVVY" WORKHORSE. 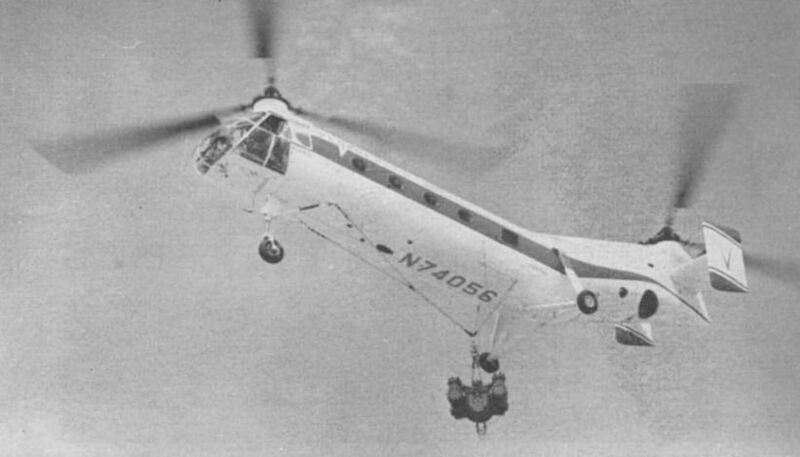 The Vertol Model 44 "Workhorse" helicopter is a civilianised version of the military H-21 (Model 42). Three versions are offered to would-be customers; ranging from the 44A, a nineteen-passenger transport; the 44B freight and passenger transport with seating for fifteen, and the 44C, a luxury eight-passenger executive transport. Both the 44A and B are quickly convertible from passenger to cargo carrying; the seats being removed or folded back against the cabin walls. The cabin, claimed to be the world's largest for helicopters, is 20 ft. long, 66 in. high and 68 in. wide. Power comes from a Lycoming-Wright R-1820-103 engine of 1,425 h.p. Dimensions are as follows: Fuselage length, 52 ft. 6 in., height 16ft., rotor diameter 44 ft. Maximum speed 140 m.p.h., range 400 miles. Loaded weight 13,300 lb. Recently flown at Babicach (Lublin) by Brig.-Gen, Jan Frey-Bielecki, this faithful replica of a 1910 Henri Farman Type IV was built by a veteran Polish engineer, Pavel Zolotow. Former enemy twin trainers in civil guise have recently enlivened airport movements. Kansan N10008 with the U.S.A.F. serial 42-37036 hardly obliterated, came into Southend from Iceland on 2nd October. The late Sir Charles Kingsford Smith's famous Fokker FVII/Fx VH-USU (no c/n.) "Southern Cross" and the late Ross and Keith Smith's Vickers Vimy G-EAOU (ex-F8630) are to be preserved in concrete and glass mausoleums at Brisbane and Adelaide respectively. The Trans Pacific veteran was recently delivered safely and erected as shown below, but the 1919 England-Australia Vimy has been partially destroyed by fire. This took place on 3rd November, 160 miles east of Adelaide, while in transit on two R.A.A.F. Queen Marys. Photograph shows the Nord 2506, a development of the 2501 with a Turbomeca Marbore turbojet at each wingtip. 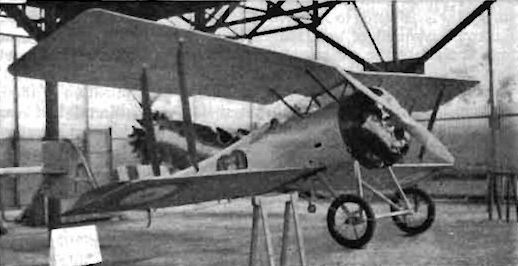 Left shows the Boeing 100-A; right, after conversion to a Curtiss Helldiver. First photograph to be published showing the first of the Folland Gnat light fighters in the colours of the Indian Air Force. The Gnat will eventually be produced under licence in India by the Hindustan Aircraft Company. Serial number of the first Indian Gnat is IE 1059. 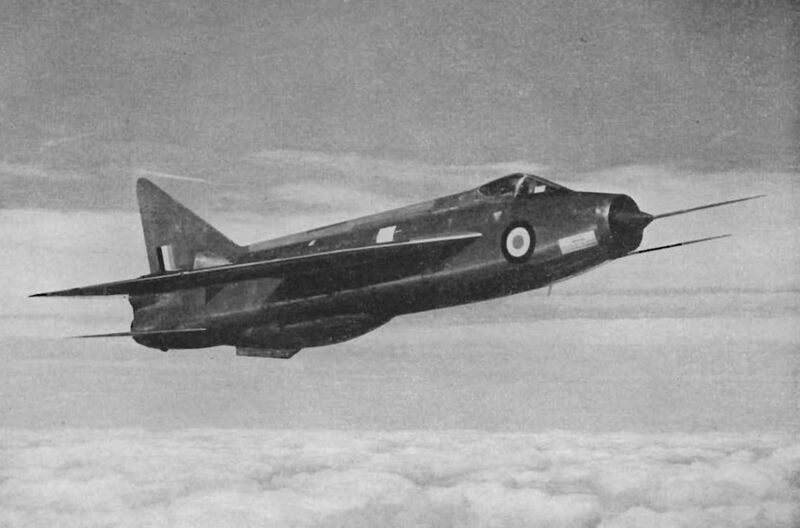 The English Electric P1.B supersonic fighter is now flying with its main armament of two de Havilland Firestreak air-to-air missiles mounted on pylons on either side of the fuselage. VELVET GLOVE. Intended for use on the CF-100 all-weather fighter, the Velvet Glove was developed by the Canadian Research and Development Establishment during 1952-53. It is an air-to-air missile powered by an internal sustainer rocket, probably burning a solid propellent. Despite early promise, the contract for it to be built by Canadair was cancelled in 1956 as it was claimed that it had insufficient range. To replace the Velvet Glove the Sperry Sparrow missile will be produced under licence. Note the size of the Velvet Glove fitted to this CF-100 and the modified nose of the aircraft. 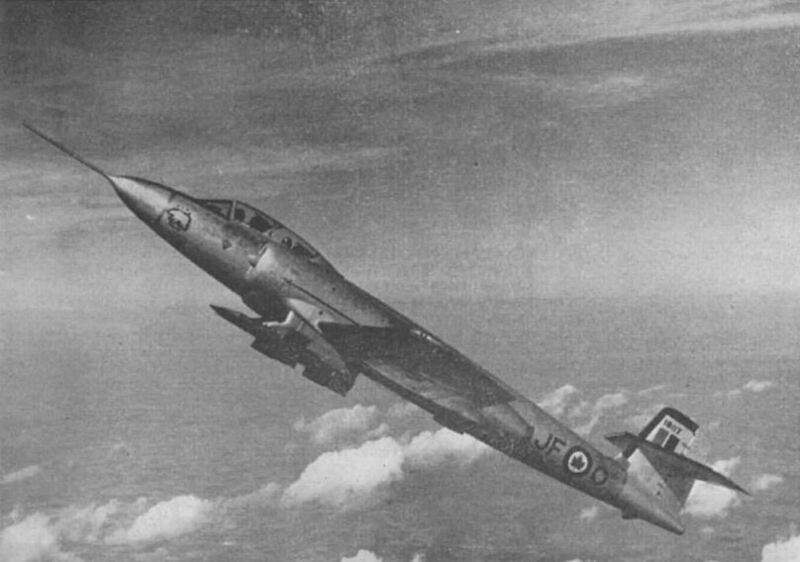 AVRO CF-105 ARROW. Canada's first supersonic aircraft, the CF-105 Avro Arrow, was unveiled on 4th October, at Avro Aircraft plant at Malton, Ontario, four years from the time Avro was given the authorisation to design and produce a successor to the CF-100. The Canadian Government ordered the Arrow in July 1953 and within two months the first wind tunnel tests were being run. These ranged from slow speeds to twice the speed of sound, and seventeen models of various sizes were used to obtain necessary structural and aerodynamic data. Eleven large-scale free-flight models with rocket-propelled boosters were fired at ranges in Canada and the United States between 1954 and January of this year. During 1954 when preliminary design was completed, the R.C.A.F. adopted the CF-105 designation for the aircraft. Later in 1954 power plant problems arose which required major changes in the proposed programme. The Rolls-Royce RB106 engines which were incorporated in the design would not be available in time for the CF-105, and were replaced by two Curtiss-Wright J67 engines. Then, in early 1955, the U.S. Air Force disclosed that the J67 also would be too late to meet the Avro schedule. At this point, the programme now in effect was established - the installation of Pratt & Whitney J75s, as an interim measure, and Orenda PS 13s (Iroquois) when they became available. Although the Iroquois development was well advanced, and its specifications more than met Avro's requirements, the combination of an untried engine and an untried airframe was considered not practical on an aircraft development flight test programme. One of the greatest problems, as in many of the aircraft operating over large speed ranges, was to make the air intakes efficient, and on the Arrow the boundary layer is bled off through an array of holes immediately in front of the air intakes. The air is then passed through a duct which is vented immediately below and just behind the intake. The detachable weapons bay is larger than that of the Boeing Superfortress, and will house Sperry Sparrow 2 guided missiles, which will be lowered one at a time for firing. Cameras or nuclear bombs can also be carried. The thin wing has a 60-degree sweepback, a notched, saw-tooth leading-edge and wing fences. In case of an emergency the crew of two will escape with the aid of Martin-Baker Mk. 5 ejection seats. The Arrow is expected to make its first flight some time this month. 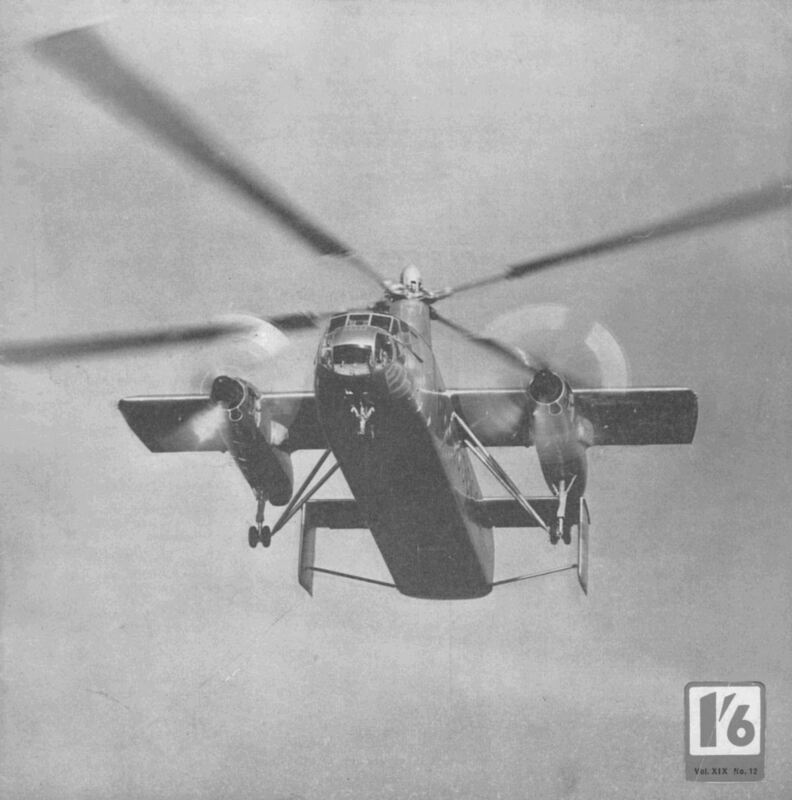 Photograph is of the Aero L.200 Motorava, development of the Super Aero 45. It is powered by two Walter Minor 6-III engines of 160 h.p. each which give it a maximum speed of 186 m.p.h. Span 41 ft. 0 in., length 23 ft. 7 in., height 9 ft. 2 in. BERIEV Be-8. Designed by Beriev, the Be-8 first appeared during 1951 and is a logical development of the Be-6, the standard twin piston-engined flying-boat of the Russian Naval Air Arm which it resembles closely. Like the Be-6, the Be-8 was designed primarily to undertake long ocean patrols for reconnaissance and anti-submarine duties. It can also be used as a transport. Powered by two Klimov WK-1 turbojets of unspecified thrust, the aircraft has a maximum speed of about 360 m.p.h., as compared with a maximum 258 m.p.h. of the Be-6. Unlike its predecessor it has a single fin and rudder and the tailplane is mounted midway up the fin. 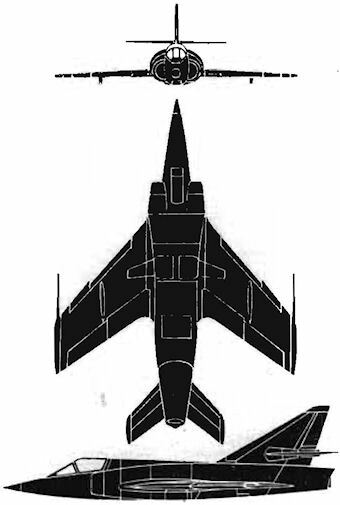 In order to improve the airflow at this junction, a fairing was added similar to the "acorn" used on the fin/tailplane junction of the Hawker Sea Hawk. The Be-8s fuselage is similar to that of the 6 but the cockpit is much smaller and offset to port as on the D.H.110 Sea Vixen. The wing configuration on both aircraft is similar from the front view, but differs in the plan view in the Be-8 in having an almost straight leading edge (the Be-6 is tapered), and a tapered trailing edge (Be-6 has a straight trailing edge). The two turbojet engines are mounted almost centrally on the highest point of the cranked wing, which in its outer section becomes slightly anhedral, and has retractable wingtip floats similar to those on the Convair Catalina. Armament consists of four gun positions; one in the nose, one in the tail and two remotely controlled in blisters on both sides of the fuselage, under and just ahead of the tailplane. It can also probably carry depth charges, mines, sono-bouys and other war loads under the wings. 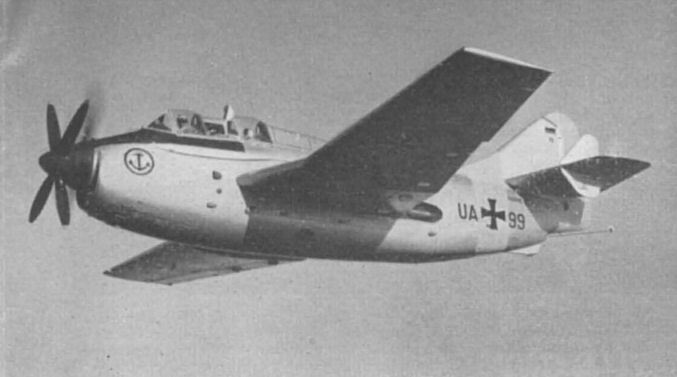 No data has been released on the Be-8, which probably exists in prototype form only, but the dimensions and weight approximate those of the Be-6, which are: Span 108 ft. 4 in. ; loaded weight 51,588 lb. The world's first vertical take-off airliner, the Fairey Rotodyne, made its first flight on Wednesday, 6th November. It takes off like a normal helicopter and once airborne, power is gradually transferred to the propellers. For landing, the process is reversed. V.T.O. AMERICAN-STYLE. There are many methods of vertical takeoff ranging from the brute force of the Rolls-Royce V.T.O. test-bed to the more sophisticated Short SC.1 and Bell X-14. The SC.1 has a normal jet engine for horizontal takeoff and a battery of smaller jet engines located in the fuselage belly for V.T.O. The Bell X-14 is powered by two Armstrong Siddeley ASV.8 Viper turbojets of 1,750-lb. thrust, which are mounted horizontally, fed by a nose intake and the jet stream deflected through vents in the fuselage belly. 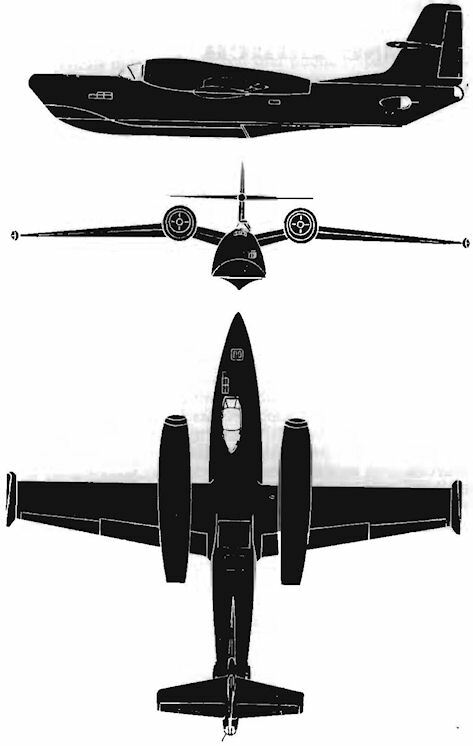 The X-14 takes off with the jet stream deflected downwards and transition is accomplished by directing the jetstream backwards. YAKOVLEV YaK-12A. For some years the YaK-12M has been widely used in Russia and the various satellite countries, but insufficient payload and small range have limited its value. A design team under A. S. Yakovlev, in co-operation with the requirements of Aeroflot, made a new variant which has successfully carried out tests and has been recommended for series production. It has the designation YaK-12A and differs externally in the shape of the main flying surfaces. The wing now has a trapezoidal shape in plan view and is 1.26 sq.m. less in area than that of the YaK-12M. The body of each half-wing is formed from a leading edge longeron, a partial rear longeron, three stringers and a nose (leading edge) profile. There are 36 ribs. An extra connexion links the two longerons at rib 4?I9. Each half-wing has a fuel tank for 166 kgm. of fuel. The wing is equipped with flaps, ailerons and automatic slots. The last are fitted between ribs #19 and 35, opposite the ailerons. 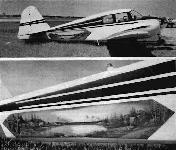 The empennage has a new horizontal shape, now being trapezoidal in contrast to that of the YaK-12M. It is supported by two pairs of bracing wires, instead of three pairs and two struts. Among new features of the YaK-12A are new control systems and instruments. There is a new electric fuel-level gauge; and PVD-6M air pressure indicator replaces the PVD-954 of the YaK-12M, and a PO-250 frequency converter replaces the PO-500. The aircraft headlight (landing light) is in the leading edge of the wing. The passenger cabin is now more comfortable and the side panels, doors and ceiling are covered with woollen fabrics. The instrument panel consists of pilot's and navigating instruments, in front of the pilot, motor controls in the central part, and the radio compass panel at the right. An MP-85 motor heater is installed in the cowling, and a new eight-inch radiator is installed in the oil system. Oil tank capacity is increased to 29 litres. Useful load is now 105 kgm. more, allowing three instead of two passengers on the passenger variant. As an ambulance it can carry two patients (one sitting, one lying) and a medical attendant; as a freighter - 250 kgm. load. French Naval York number 2 is shown in this photograph. The Czech-built Siebel Si.204D D-IDOM has appeared in Germany. BIRD OF MERCY. 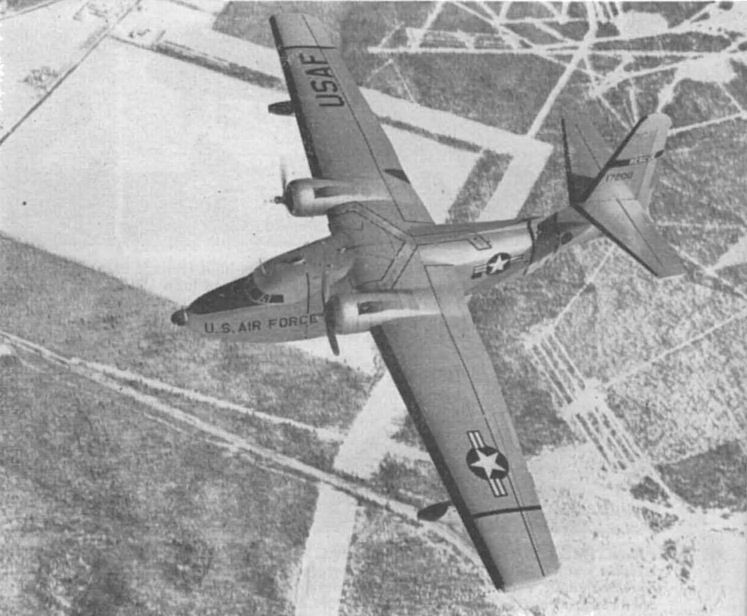 First photograph ever to be published of the Grumman G-64 SA-16B (U.S. Navy UF-1) Albatross shows it to have a much greater span. It is now mainly in use with the U.S.A.F. as an amphibian for Sea Rescue duties, and a limited number are in use as utility amphibians with the Navy and Coast Guard. The 16B has accommodation for a crew of four to six, and as an ambulance can carry twelve stretchers. For transport work twelve passengers are carried in addition to a crew of four. Racks under the wings can carry bombs, depth charges, auxiliary fuel tanks, a rescue boat, and other items. Dimensions: Span 96 ft. 6 in. ; length 60 ft. 8 in. ; height 24 ft. 3 in. Weight, empty 20,300 lb., loaded 29,500 lb. (approximate). Maximum speed at sea-level 290 m.p.h. (approximate). A photograph of a Hanriot HD-1, one of the few remaining of this type still in existence. 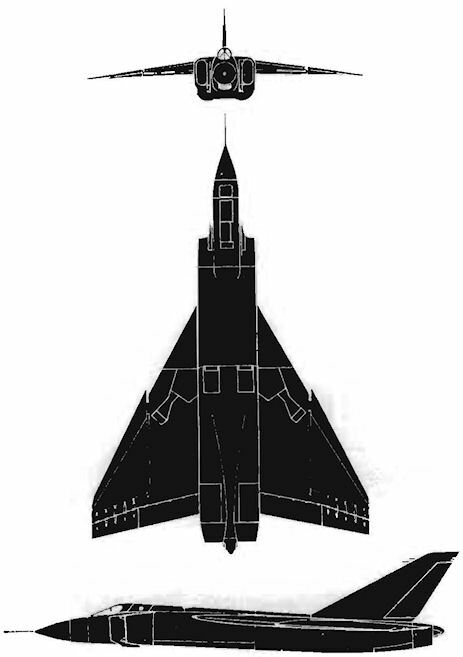 This silhouette of the Dassault Etendard VI shows that is has the same wing planform as the Super Mystere B2. The leading edge, however, has been shouldered (thickened) at the root, and this is claimed to increase control at low speeds. The wing also has double-slotted flaps and movable leading-edge flaps, all being electrically operated. Airbrakes are mounted under the fuselage and give a deceleration of 4g at a speed of 400 m.p.h. Armament consists of machine guns in a detachable pack and a wide variety of stores can be carried under the wings. Production version of the Etendard VI will be powered by a Bristol Orpheus B.Or.12 of 6,723-lb. thrust (8,168 lb. with afterburning). A photographic-reconnaissance and a two-seat trainer version are to be constructed. Dimensions: Span 26.9 ft., length 39.3 ft., height I 1.4 ft.
We have seen all types of oil paintings in places ranging from the National Gallery to those hanging in the old fashioned parlour, but never thought to see one on the side of an aircraft. The owner of this Piper Apache must either like the view or is trying to hide something. REGHIN RG-6. Early this year the Rumanian factory LFIL Reghin built a new type of a light sport and training machine, which is designated Rg-6. 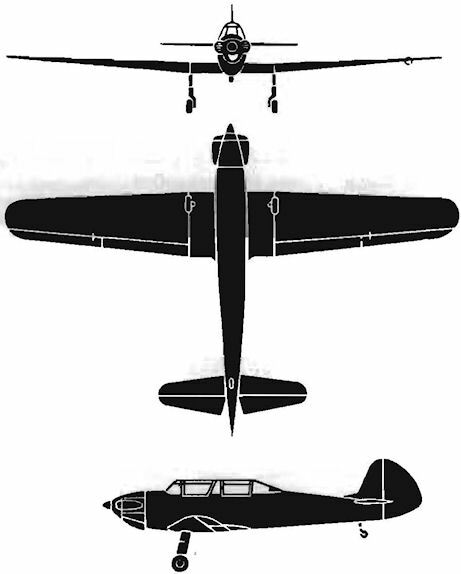 A team under leadership of W. Novitschi, who earlier designed some of the first post-war Rumanian gliders, i.e. Rg-1 and Rg-2, was responsible for the design of the machine, which today is in production for national aero clubs organisation called AVSAP. This two-seater cantilever low-wing machine of semi-monocoque wooden structure is powered by a 75-h.p. flat air-cooled Praga-D engine, driving a wooden propeller of fixed pitch. The wing is built of three sections and is of wooden structure throughout, except the control surfaces which are fabric covered as are the tailplane and fin control surfaces. The cockpits are arranged in tandem and possess separate canopies, which hinge to the starboard when opened. Complete dual controls are employed. The cantilever fixed undercarriage possesses oleo-pneumatic shock absorbers. A non-steerable tail-wheel is fitted. Two main fuel tanks are accommodated in the central section of the wing (8.4 gal. ), with an additional container (1.98 gal.) housed in the fuselage. Mr. Novitschi's team is enaged at present in the work on a further version called Rg-7, which will be used as an advanced trainer and aerobatic machine in the AVSAP. First flying view of the new Polish tandem-seat SZD S-4 Kania 2 parasol monoplane which was first flown on 3rd September of this year at Mielec in Central Poland. Powered by a 125-h.p. licence-built Russian M-11 five-cylinder radial, the dual control, aerobatic and glider-towing Kania 2 has a maximum speed of 112 m.p.h. for an a.u.w. of 1,765 lb. Designer: Ing. E. Stankiewicz. 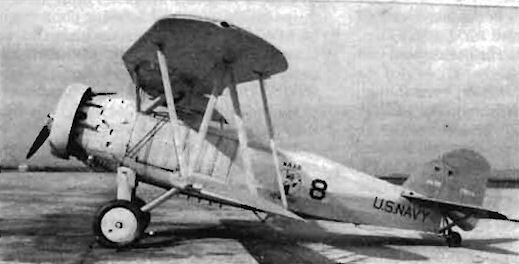 The I.A.45 light transport powered by two piston engines installed on the trailing edge of the wing. It will be used for numerous duties with the armed forces of Argentina.